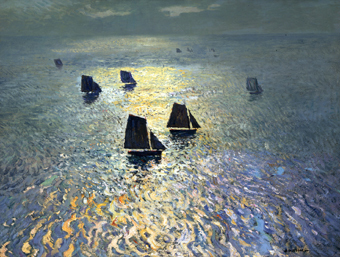 During the late 19th and early 20th centuries, California artists produced a unique style that combined several distinctive aspects of American and European art. This style—known as California Impressionism or California plein air painting, after the French term for “in the open air”—focused on capturing the special light and color of the state’s landscape and helped to define modern landscape painting. Impressionism was initially embraced by a small group of radical artists working in France during the late 1860s. Their work was greeted with scorn and criticism by the Royal Academy and the public. By the time Impressionism was introduced in the United States around 1885- 90, much of the hostility had dissipated and the style was favorably received. Many of America’s leading artists studied Impressionism in Paris and brought it back to the United States, invigorating progressive American art. California’s majestic landscape was the inspiration for artists who came to the burgeoning turn-of-the-century art colonies in Carmel and Laguna Beach. They created a profusion of light-filled paintings that captured its sublime but fragile beauty, in a Post- Impressionist manner that established a new, distinctive modern style. Just as earlier French artists had captured the colors and light of rural France, this indigenous West Coast school of artists dedicated itself to portraying the brilliant and convincing effects of natural light on the local landscape in a fresh American voice. This exhibition explores the impact of Impressionism and modernism on American painters from the West Coast and features many of the most important artists of the period, including Franz Bischoff, Emil Kosa, Phil Dike, Edgar Payne, William Wendt, Guy Rose, and Granville Redmond. 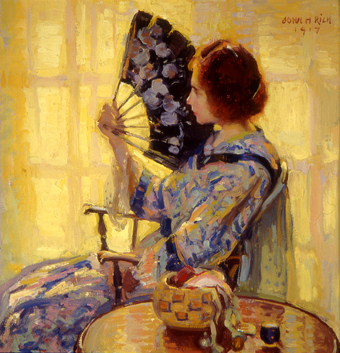 Don’t miss this stunning collection of 60 paintings from the collection of The Irvine Museum, California. Organized by The Irvine Museum and host curated by Bruce Guenther, chief curator and The Robert and Mercedes Eichholz Curator of Modern and Contemporary Art. Sponsors: Judith Anderson, Mary C. Becker, Laura S. Meier, Frederick D. and Gail Y. Jubitz Foundation, Travers Hill Polak, Dr. Alton and Celia Wiebe, Judy C. and Martin Kelley Endowment Fund, Liane and Richard Cabot, European and American Art Council of the Portland Art Museum, Bonhams, and Acorn Fund of The Oregon Community Foundation. Hotel Partner: Provenance Hotels.